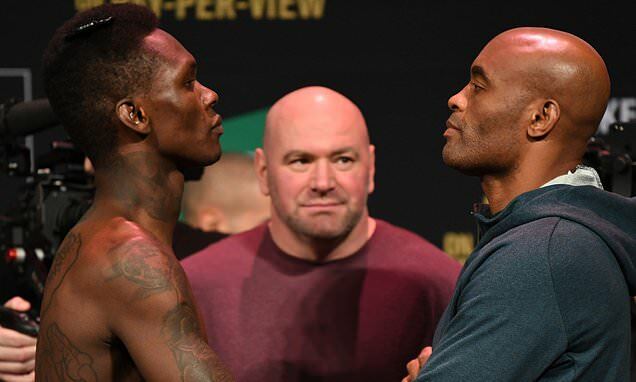 UFC legend Anderson Silva takes on rising star Israel Adesanya in UFC 234’s main event in Melbourne. The Australian fans had been looking forward to Robert Whittaker’s middlweight title defence against Kelvin Gastelum but the champion was forced to withdraw at the 11th hour after suffering severe abdominal pains. He was hospitalised and required surgery on a hernia in a terrible blow both personally and for the UFC. But the show goes on and Silva’s clash with ‘Stylebender’ should hopefully provide a superb spectacle now that it’s been bumped up to the showpiece slot. Follow all the action with live updates from Sportsmail’s feed throughout the night. That was a fight in a phone box to start the main card. Both men came out swinging and then.. kept swinging. Eventually it was the South Korean Kyung Ho Kang who managed to sink in a submission and rather than tapping, his Japanese opponent Ishihara simply allowed himself to go to sleep. Your body clock might be all over the place but so is this UFC 234 card. Whittaker’s late withdrawal from the main event has been a crushing blow but hopefully Silva vs Adesanya can make up for it. More on the Whittaker news to come, but for now we’ll focus on the stacked pre-lim line up.